last week I did another round of re-triggering for a root cause and found some root causes! This week I got an email from orange factor outlining the top 10 failures on the trees (as we do every week). Unfortunately as of this morning there is no work for me to do- maybe next week I can hunt. harness infra, test chunk is taking too long- problem is being addressed with more chunks. As you can see there isn’t much to do here. Maybe next week we will have some actions we can take. Once I have about 10 bugs investigated I will summarize the bugs, related dates, and status, etc. I am excited to announce a new focused project for contribution – Dashboard Hacker. Last week we gave a preview that today we would be announcing 2 contribution projects. This is an unpaid program where we are looking for 1-2 contributors who will dedicate between 5-10 hours/week for at least 8 weeks. More time is welcome, but not required. What is a dashboard hacker? When a developer is ready to land code, they want to test it. Getting the results and understanding the results is made a lot easier by good dashboards and tools. For this project, we have a starting point with our performance data view to fix up a series of nice to have polish features and then ensure that it is easy to use with a normal developer workflow. Part of the developer work flow is the regular job view, If time permits there are some fun experiments we would like to implement in the job view. These bugs, features, projects are all smaller and self contained which make great projects for someone looking to contribute. Get in touch with us either by replying to the post, commenting in the bug or just contacting us on IRC (I am :jmaher in #ateam on irc.mozilla.org, wlach on IRC will be the primary mentor). We will point you at a starter bug and introduce you to the bugs and problems to solve. If you have prior work (links to bugzilla, github, blogs, etc.) that would be useful to learn more about you that would be a plus. There is no real criteria here. One factor will be if you can meet the criteria outlined above and how well you do at picking up the problem space. Ultimately it will be up to the mentor (for this project, it will be :wlach). If you do apply and we already have a candidate picked or don’t choose you for other reasons, we do plan to repeat this every few months. With all this talk of intermittent failures and folks coming up with ideas on how to solve them, I figured I should dive head first into looking at failures. I have been working with a few folks on this, specifically :parkouss and :vaibhav1994. This experiment (actually the second time doing so) is where I take a given intermittent failure bug and retrigger it. If it reproduces, then I go back in history looking for where it becomes intermittent. This weekend I wrote up some notes as I was trying to define what an intermittent is. bug 1157090 hadn’t reproduced in 2 weeks- was APZ feature which we turned off. This leaves us with 12 bugs to investigate. The premise here is easy, find the first occurrence of the intermittent (branch, platform, testjob, revision) and re-trigger it 20 times (picked for simplicity). When the results are in, see if we have reproduced it. In fact, only 5 bugs reproduced the exact error in the bug when re-triggered 20 times on a specific job that showed the error. Bug 1161915 – Windows XP PGO Reftest. Found the root cause (pgo only, lots of pgo builds were required for this) 23 revisions back. Bug 1160780 – OSX 10.6 mochitest-e10s-bc1. Found the root cause 33 revisions back. Bug 1161052 – Jetpack test failures. So many failures in the same test file, it isn’t very clear if I am reproducing the failure or finding other ones. :erikvold is working on fixing the test in bug 1163796 and ok’d disabling it if we want to. Bug 1161537 – OSX 10.6 Mochitest-other. Bisection didn’t find the root cause, but this is a new test case which was added. This is a case where when the new test case was added it could have been run 100+ times successfully, then when it merged with other branches a couple hours later it failed! bug 1155423 – Linux debug reftest-e10s-1. This reproduced 75 revisions in the past, and due to that I looked at what changed in our buildbot-configs and mozharness scripts. We actually turned on this test job (hadn’t been running e10s reftests on debug prior to this) and that caused the problem. This can’t be tracked down by re-triggering jobs into the past. In summary, out of 356 bugs 2 root causes were found by re-triggering. In terms of time invested into this, I have put about 6 hours of time to fine the root cause of the 5 bugs. There are all kinds of great ideas folks have for fixing intermittent issues. In fact each idea in and of itself is a worthwhile endeavor. I have spent some time over the last couple of months fixing them, filing bugs on them, and really discussing them. One question that remains- what is the definition of an intermittent. I don’t plan to lay out a definition, instead I plan to ask some questions and lay out some parameters. According to orange factor, there are 4640 failures in the last week (May 3 -> May 10) all within 514 unique bugs. These are all failures that the sheriffs have done some kind of manual work on to star on treeherder. I am not sure anybody can find a way to paint a pretty picture to make it appear we don’t have intermittent failures. There are a lot of reasons, many of these have nothing to do with poor test cases or bad code in Firefox. But many of these are showing up many times a day and as a developer who wants to fix a bad test, many are not really actionable. Do we need to have some part of a definition to include something that is actionable? Looking at the history of ‘intermittent-failure’ bugs in Bugzilla, many occur once and never occur again. In fact this is the case for over half of the bugs filed (we file upwards of 100 new bugs/week). While there are probably reasons for a given test case to fail, if it failed in August 2014 and has never failed again, is that test case intermittent? As a developer could you really do anything about this given the fact that reproducing it is virtually impossible? This is where I start to realize we need to find a way to identify real intermittent bugs/tests and not clutter the statistics with tests which are virtually impossible to reproduce. Thinking back to what is actionable- I have found that while filing bugs for Talos regressions the closer the bug is filed to the original patch landing, the better the chance it will get fixed. Adding to that point, we only keep 30 days of builds/test packages around for our CI automation. I really think a definition of an intermittent needs to have some kind of concept of time. Should we ignore intermittent failures which occur only once in 90 days? Maybe ignore ones that don’t reproduce after 1000 iterations? Some could argue that we look in a smaller or larger window of time/iterations. Lastly, when looking into specific bugs, I find many times they are already fixed. Many of the intermittent failures are actually fixed! Do we track how many get fixed? How many have patches and have debugging already taking place? For example in the last 28 days, we have filed 417 intermittents, of which 55 are already resolved and of the remaining 362 only 25 have occurred >=20 times. Of these 25 bugs, 4 already have patches. It appears a lot of work is done to fix intermittent failures which are actionable. Are the ones which are not being fixed not actionable? Are they in a component where all the developers are busy and heads down? what is the general threshold where something is intermittent? what is the general threshold where we are too intermittent and need to backout a fix or disable a test? what is a reasonable timeframe to track these failures such that we can make them actionable? Thanks for reading, I look forward to hearing from many who have ideas on this subject. Stay tuned for an upcoming blog post about re-trigging intermittent failures to find the root cause. The question becomes, how do we manage to keep up test coverage without growing the number of machines? Right now we do this with buildbot coalescing (we queue up the jobs and skip the older ones when the load is high). While this works great, it causes us to skip a bunch of jobs (builds/tests) on random pushes and sometimes we need to go back in and manually schedule jobs to find failures. 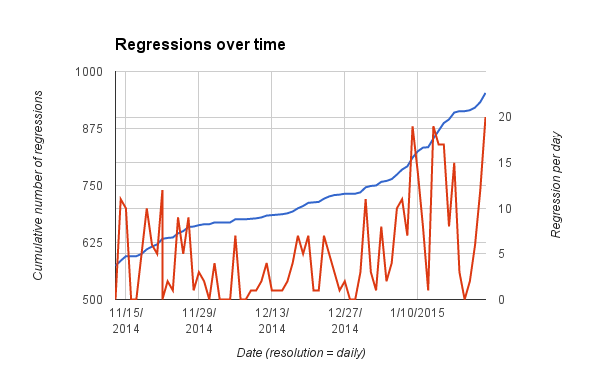 In fact, while keeping up with the automated alerts for talos regressions, the coalescing causes problems in over half of the regressions that I investigate! Knowing that we live with coalescing and have for years, many of us started wondering if we need all of our tests. Ideally we could select tests that are statistically most significant to the changes being pushed, and if those pass, we could run the rest of the tests if there were available machines. To get there is tough, maybe there is a better way to solve this? Luckily we can mine meta data from treeherder (and the former tbpl) and determine which failures are intermittent and which have been fixed/caused by a different revision. A few months ago we started looking into unique failures on the trees. Not just the failures, but which jobs failed. Normally when we have a failure detected by the automation, many jobs fail at once (for example: xpcshell tests will fail on all windows platforms, opt + debug). When you look at the common jobs which fail across all the failures over time, you can determine the minimum number of jobs required to detected all the failures. Keep in mind that we only need 1 job to represent a given failure. This translates to about 1.5 changes per week. To put this another way, if we were only running the 77 reduced set of jobs, we would have missed one regression December 2nd, and another December 16th, etc., or on average 1.5 regressions will be missed per week. In a scenario where we only ran the optional jobs once/hour on the integration branches, 1-2 times/week we would see a failure and have to backfill some jobs (as we currently do for coalesced jobs) for the last hour to find the push which caused the failure. * keep in mind this is weighted such that we prefer to run jobs on linux* builds since those run in the cloud. With all of this information, what do we plan to do with it? We plan to run the reduced set of jobs by default on all pushes, and use the  optional jobs as candidates for coalescing. Currently we force coalescing for debug unittests. This was done about 6 months ago because debug tests take considerably longer than opt, so if we could run them on every 2nd or 3rd build, we would save a lot of machine time. This is only being considered on integration trees that the sheriffs monitor (mozilla-inbound, fx-team). How do you plan to keep this up to date? We run a cronjob every day and update our master list of jobs, failures, and optional jobs. This takes about 2 minutes. What are the chances the reduced set of jobs catch >1 failure? Do we need all 77 jobs? Thanks for reading so far! This project wouldn’t be here it it wasn’t for the many hours of work by Vaibhav, he continues to find more ways to contribute to Mozilla. If anything this should inspire you to think more about how our scheduling works and what great things we can do if we think out of the box.